Union that believes in the common ownership of goods and services. In March 1985 the Soviet Communist Party elected him general secretary of the party and leader of the Soviet Union. He resigned in 1991 shortly after the fall of communism. This is no doubt a well documented biography of the well respected, ideological former president of the Soviet Union. But it would have been more appreciated if his childhood days were inclusive so as to make it more comprehensive. But nevertheless, it was a well done job. Thanks. 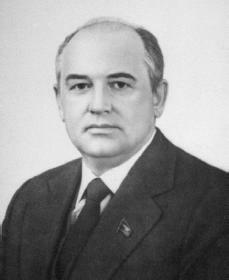 The Encyclopedia of World Biography has traced Mikhail Gorbachev's leadership in domestic and international community. Yet, it has not considered Gorbachev's policies of glasnost and perestroika, - two terms with which every high school sophomore is/should be familiar. By the way, in paragraph two of the section entitled, "Climbing the Party Ladder," an error is present: "In 1978, at the request of Brezhnez [...]." "Brezhnez" should be read as "Brezhnev." Hi Mikhail, This is Cliff live in the United States. How are you? I am fine. I already like you Mr Gorbachev smile! My Memory of Ronald Reagan and you Mikhail Gorbachev 1980-1991. You doing Great Mikhail, I Love This USSR Russian so much smile!